Can House Cats get Fleas? ~ Pawsitively Humane, Inc.
Can House Cats get Fleas? How are cat fleas different? To understand what the fleas are capable of, it’s first important to understand why they are different to other kinds of fleas. Firstly, they have massive jumping capabilities. They can cover up to seven inches vertically and thirteen horizontally, that would be the equivalent of 76M up and 137M across for humans – a pretty long way. Indoors they tend to live and hatch in carpets, floor cracks and in the creases of furniture. While they need to eat (you/your cat) to breed and lay eggs, they can survive in a dormant state for any time up to a year. Excluding the instance of your indoor cat making its way outside, in which case the cause is obvious, the cause comes from the fleas’ ability to jump those huge distances. Outdoors they tend to live in muddy and sandy areas, as well as long grass, so fleas can jump on to humans or other animal residents in your house. They can also get in via windows. If you regularly leave your window open, fleas can jump onto your cat either form another cat coming up to the window or by long grass near the window giving them a close enough area to jump from. While the contractions of fleas may be different for indoor cats, getting rid of them is always the same. There are plenty of different kinds of medication to help remove fleas from the cat. Things like Frontline spot on cat are applied to the collar where they can’t reach with their mouths and tend to be really effective. If you’re house is infected with fleas it can be a little more difficult. Flea powders are effective if applied thoroughly throughout the house, but they really do need to be applied to all areas rigidly if you’re to avoid any return of the fleas. While cat fleas may be slightly different biologically to other fleas, the main point of this is to highlight how flea prevention should not be avoided or treated any differently when you have indoor cats. Prevention is much easier to handle than removal, so being pro-active is always the answer. My cats complain about having the Frontline put on, but it's better than getting fleas. A woman I know went through a minor infestation, because someone tracked the fleas in from another house. After that, I was no longer under the impression that my cats were immune. We haven't had fleas, but I now know that it's still a possibility. Thanks so much for the info and I will bear in mind that Frontline is the best way to get rid of fleas for cats. Great blog!! I will check out the Zee and Zoey book it looks amazing. 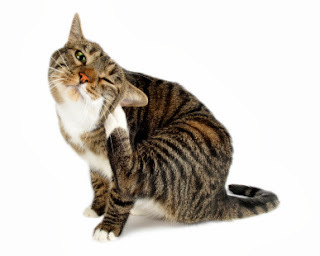 Fleas on cats can deal a severe harm to the cat’s skin, it is the most common cause of skin disease among cats..